This article is intended for those people who have had little experience with electronic fuel injection and would like to have a handle on the basics. EFI as applied to automobiles in mass production use was first introduced in the late 1960s. The Bosch D Jetronic analog system was widely used by Volvo and VW. This system was well engineered and quite reliable given the technology available at the time. The ’70s saw the introduction of the excellent L Jetronic system and licensed spinoffs built in other countries. Emission regulations and the energy crisis in the mid ’70s caused most car manufacturers to consider the switch to EFI. Nissan, Toyota and BMW notably equipped almost all of their higher end models with the Bosch system by 1982. Many German and American car companies were slow to embrace EFI for reasons unknown. By 1985, the first digital systems were in widespread use worldwide by most manufacturers to some degree and the days of the carburetor were numbered. Today, over 95% of all cars produced are EFI equipped. EFI is certainly not new, as its roots were firmly established over 30 years ago. EFI uses solenoid valves called injectors to meter fuel delivery. 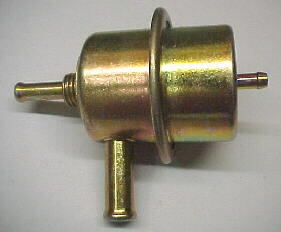 Most vehicles today use 1 injector per cylinder. When the solenoid is energized, fuel sprays out into the valve port. Fuel is delivered to the injector by a high pressure electric pump at around 40 psi. Fuel delivery is controlled by the injectors which are cycled by the computer. The computer produces a signal to open the injectors for a certain length of time depending on engine conditions relayed by sensors. The longer that the injector is open, the more fuel is injected. As engine load and rpm are increased, the injector open times are increased to match increasing airflow. This computer output signal is called the injector pulse width. The longer the pulse width, the more fuel is injected. Standard spark ignited, 4 stroke engines require that the correct proportion of fuel be mixed with the incoming air for efficient operation. This proportion is in the range of 13 parts air to 1 part fuel for best power, 15 to 1 for best emissions and 17 to 1 for best economy. Most modern engines aim for a ratio of around 14.7 to 1 for the majority of cruising and medium power conditions. This is the chemically correct ratio which results in the lowest average emissions and reasonable power. A rich condition is characterized by an excess of fuel and a lean condition is characterized by an excess of air or lack of fuel. As rpm is increased, up to a point, airflow also increases and fuel flow must increase to match it. As the throttle is opened at a given rpm, airflow increases to a certain point and again, fuel flow must follow airflow. EFI fuel systems consist of a tank, pump, fuel rail, regulator, injectors and return line. Fuel is drawn from the tank by the pump which steps up pressure to around 40 psi. Fuel pressure is controlled by the fuel pressure regulator located on one end of the fuel rail by bleeding fuel back to the tank through the return line. The pump always puts out an excess of fuel so large quantities are returned back to the tank during idle and low speed conditions and less as engine demand increases. The fuel rail is essentially a tubular fuel manifold designed to carry fuel to the injectors as well as hold them in place on the intake manifold. The injectors are usually sealed with O-rings on each end. 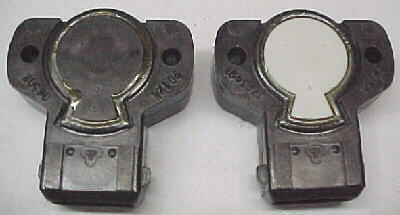 One end has the fuel entering from the rail and the other end spigots into the manifold. 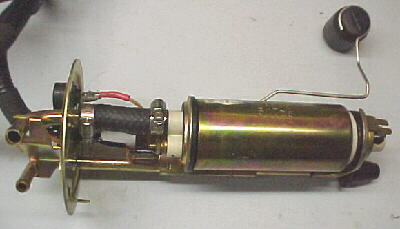 The injector has an 2 pin electrical plug to carry switching current to the solenoid windings. When energized, the solenoid core is pulled back which pulls back a sealing pintle, disc or ball, allowing fuel to spray out in a fine, conical pattern. The amount of air entering the engine is controlled by a conventional butterfly valve on most engines located in a throttle body assembly. Airflow measurement is by one of two basic methods; Mass Airflow and Speed Density. 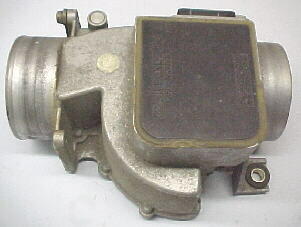 The mass airflow method uses either a spring loaded flap attached to a potentiometer or a heated wire mounted in front of the throttle body to sense actual airflow. The position of the flap or amount of current required to keep the wire heated to a certain temperature is relayed to the computer as a voltage signal. A certain voltage equals a certain airflow rate. Flap detail. Note air temp sensor. The speed density system uses a solid state pressure transducer to measure the pressure in the intake manifold combined with rpm and air temperature to indirectly determine airflow. Again, a certain pressure relates to a certain voltage which is relayed to the computer. Most systems measure rpm off of the ignition coil tachometer pulse or crank triggered magnetic/Hall effect sensors. Rpm is considered a primary input signal on all EFI systems. Most systems generate an injection pulse for every tach pulse so as rpm is increased, the frequency of injection pulses is also increased. On mass airflow type systems, this input is also considered a primary input signal. X amount of air requires Y amount of fuel. 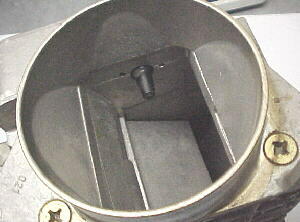 As rpm and throttle opening is increased, airflow increases to a point. On speed density type systems, this input is essential when combined with the rpm signal to calculate airflow. As the throttle is opened, the manifold pressure increases which will require more fuel. This input is a secondary input on most systems. It is required mainly for acceleration enrichment when the throttle is rapidly opened. By looking at the rate of change of throttle blade angle, the computer can determine how quickly the throttle is being opened and can supply the extra fuel required momentarily to alleviate the lean condition. Throttle position is measured by a potentiometer attached to the throttle shaft. Think of the TPS input as acting like the accelerator pump on a carburetor. Some systems can use blade angle instead of manifold pressure for load information. This method is frequently employed on racing engines with hot camshafts and 1 throttle plate per cylinder where the use of a MAP sensor is difficult. Water temperature is a secondary input required mainly to ensure proper starting and warmup of the engine. When the engine is cold, the air to fuel ratio must be very rich to enable enough fuel to vaporize for proper starting. The computer increases the injector pulse width to supply extra fuel when cold and tapers this fuel off as the water temperature increases. Once the water warms past 120 degrees or so, the computer does not need to add any extra fuel. 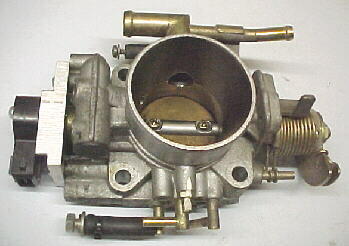 Where a carburetor chokes off air to richen the mixture when cold, EFI squirts in extra fuel to achieve the same effect. This is a secondary input required especially on speed density systems. The sensor is usually mounted in the intake manifold or air filter area. As the air temperature drops, its density increases. Denser air requires more fuel. As the temperature of the inducted air increases, the computer reduces the pulse width to compensate for lower density. Mass airflow systems are not critically affected by operation without an air temperature sensor because the airflow meter is already measuring the air mass entering the engine. This sensor is employed in closed loop systems to modify the basic pulse width after the fact. It is mounted into the exhaust manifold area. By looking at the oxygen content of the exhaust gasses after combustion, the computer can determine if the air/fuel ratio is too rich or too lean for optimum combustion and adjust the next few injections accordingly. This sensor is primarily employed for emission control and to a lesser degree, fuel economy. For the lowest average emissions, the air/fuel ratio must be kept around 14.7 to 1. 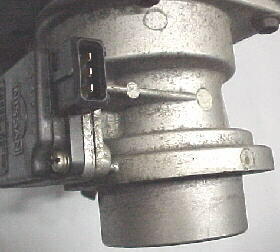 Under full throttle conditions, this sensor input is ignored by the computer so that the engine can produce more power by runner a richer mixture. This is called open loop mode and the computer is supplying the injector pulse width from tables based on all of the other sensor inputs. Once throttle opening and rpm are reduced to cruising conditions, most systems will jump back into the closed loop mode where they will stay for a large portion of the time on most street driven applications. As explained in the Basic Theory section, the computer processes all of the voltage signals from the various sensors to determine the engine operating conditions at the moment and delivers the appropriate pulse width to the injectors. If engine airflow increases by 10%, the pulse width is also increased by about 10% to keep the air/fuel ratio constant. If the rpm is doubled from 2000 to 4000 rpm, the number of injections are also doubled to double the fuel flow. The computer looks at the changes in sensor inputs every few milliseconds in order to be ready to modify the pulse width if any parameter changes.